We are here to educate, not forgive. We are here to enlighten, not accuse. Under the crust of that portion of Earth called the United States of America—“from California . . . to the Gulf Stream waters”—are interred the bones, villages, fields, and sacred objects of American Indians. They cry out for their stories to be heard through their descendants who carry the memories of how the country was founded and how it came to be as it is today. It should not have happened that the great civilizations of the Western Hemisphere, the very evidence of the Western Hemisphere, were wantonly destroyed, the gradual progress of humanity interrupted and set upon a path of greed and destruction. Choices were made that forged that path toward destruction of life itself—the moment in which we now live and die as our planet shrivels, overheated. To learn and know this history is both a necessity and a responsibility to the ancestors and descendants of all parties. The history of the United States is a history of settler colonialism— the founding of a state based on the ideology of white supremacy, the widespread practice of African slavery, and a policy of genocide and land theft. Those who seek history with an upbeat ending, a history of redemption and reconciliation, may look around and observe that such a conclusion is not visible, not even in utopian dreams of a better society. Teaching Native American studies, I always begin with a simple exercise. I ask students to quickly draw a rough outline of the United States at the time it gained independence from Britain. Invariably most draw the approximate present shape of the United States from the Atlantic to the Pacific—the continental territory not fully appropriated until a century after independence. What became independent in 1783 were the thirteen British colonies hugging the Atlantic shore. When called on this, students are embarrassed because they know better. I assure them that they are not alone. I call this a Rorschach test of unconscious “manifest destiny,” embedded in the minds of nearly everyone in the United States and around the world. This test reflects the seeming inevitability of US extent and power, its destiny, with an implication that the continent had previously been terra nullius, a land without people. Woody Guthrie’s “This Land Is Your Land” celebrates that the land belongs to everyone, reflecting the unconscious manifest destiny we live with. But the extension of the United States from sea to shining sea was the intention and design of the country’s founders. “Free” land was the magnet that attracted European settlers. Many were slave owners who desired limitless land for lucrative cash crops. After the war for independence but preceding the writing of the US Constitution, the Continental Congress produced the Northwest Ordinance. This was the first law of the incipient republic, revealing the motive for those desiring independence. It was the blueprint for gobbling up the British-protected Indian Territory (“Ohio Country”) on the other side of the Appalachians and Alleghenies. Britain had made settlement there illegal with the Proclamation of 1763. In 1801, President Jefferson aptly described the new settler-state’s intentions for horizontal and vertical continental expansion, stating: “However our present interests may restrain us within our own limits, it is impossible not to look forward to distant times, when our rapid multiplication will expand itself beyond those limits and cover the whole northern, if not the southern continent, with a people speaking the same language, governed in similar form by similar laws.” This vision of manifest destiny found form a few years later in the Monroe Doctrine, signaling the intention of annexing or dominating former Spanish colonial territories in the Americas and the Pacific, which would be put into practice during the rest of the century. signified their need for conquest and remediation. The Columbus myth suggests that from US independence onward, colonial settlers saw themselves as part of a world system of colonization. “Columbia,” the poetic, Latinate name used in reference to the United States from its founding throughout the nineteenth century, was based on the name of Christopher Columbus. The “Land of Columbus” was—and still is—represented by the image of a woman in sculptures and paintings, by institutions such as Columbia University, and by countless place names, including that of the national capital, the District of Columbia. The 1798 hymn “Hail, Columbia” was the early national anthem and is now used whenever the vice president of the United States makes a public appearance, and Columbus Day is still a federal holiday despite Columbus never having set foot on any territory ever claimed by the United States. Roxanne Dunbar-Ortiz writes in her introduction to An Indigenous Peoples’ History of the United States that “writing US history from an Indigenous peoples’ perspective requires rethinking the consensual national narrative.” What was your knowledge of Indigenous history before you began reading this book? How has reading this book changed your understanding of the “consensual national narrative”? 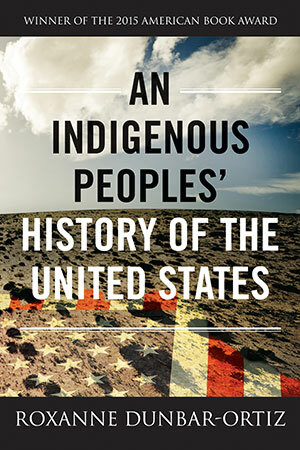 An Indigenous Peoples’ History is the latest book in the ReVisioning American History series by Beacon Press, a series intended to reinterpret history through new perspectives. How do you think this book offers a fresh viewpoint? Dunbar-Ortiz points to a central question in An Indigenous Peoples’ History, one that could easily apply to the ReVisioning series as a whole, asking, “How might acknowledging the reality of US history work to transform society?” Discuss this question. Numerous US myths are discussed in An Indigenous Peoples’ History, ranging from foundation myths surrounding Columbus to the true nature of “the Doctrine of Discovery.” Discuss these cultural (mis)conceptions. What is their influence on modern American society? What myths and stereotypes about Indigenous peoples continue in today’s society? How do we continue to reframe current events and information about Indigenous peoples? Discuss the “cult of masculinity” encouraged by Hollywood, the “Leatherstocking Tales,” and authors like James Fenimore Cooper in the era of the Jackson presidency. How has this myth allowed for the emergence of an “enduring populist imperialism”? How does it affect notions of modern US American masculinity? “Indigenous nations had defied the founding of the independent United States in a manner that allowed for their survival and created a legacy—a culture of resistance—that has persisted.” Dunbar-Ortiz points to the idealized image of the noble savage and the pervading myth that Indigenous peoples passively accepted Western colonialism and refutes them, offering instead a detailed account of their “culture of resistance.” How does this new understanding of a “culture of resistance” impact your views on US and Indigenous history? Dunbar-Ortiz quotes the late Native historian Jack Forbes, who often stressed that “while living persons are not responsible for what their ancestors did, they are responsible for the society they live in, which is a product of that past.” How should we seek to address and remedy the subversion of Indigenous peoples’ human rights? The author emphasizes the importance of land to the Indigenous community throughout An Indigenous Peoples’ History, stating that “land claims and treaty rights are most central to Indigenous peoples’ fight for reparations in the United States.” Discuss the Sioux Nation’s fight for the repatriation of the Black Hills. What are your thoughts on the Sioux Nation’s refusal of the $106 million and the controversy surrounding Mount Rushmore? “The absence of even the slightest note of regret or tragedy in the annual celebration of the US independence betrays a deep disconnect in the consciousness of US Americans.” Has reading An Indigenous Peoples’ History affected your understanding of key US American celebrations, such as Independence Day, Columbus Day, or Thanksgiving? Do you agree with the statement that the lack of regret over or recognition of tragic events betrays a disconnect in the US American consciousness? “A red thread of blood connects the first white settlement in North America with today and the future.” How does Dunbar-Ortiz reinterpret Indigenous-US relations as a “template for US imperialism and counterinsurgency wars”? How does this apply to contemporary US foreign policy? “Indigenous peoples offer possibilities for life after empire.” What does Dunbar-Ortiz suggest regarding the future?